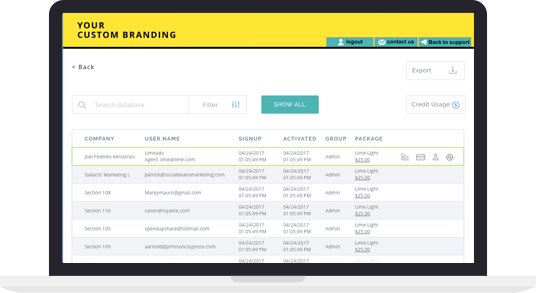 Lime provides you with a re-branded platform with complete administrative control. Package our SMS Reseller Platform solution with your other services to deliver a completely integrated program for your customer. We at Lime Cellular are fully dedicated to the idea that all businesses can harness the power of mobile marketing to help them grow substantially. Lime Cellular’s programming allows mobile marketers to be in complete control. Because we don’t sell to retail, Lime Cellulars focus remains on you. Get access to high quality marketing materials you can start using instantly. We work closely with our clients to consistently develop tools based upon their needs. We give you the power of several platforms all in one place. Automated in-house billing, strong CRM, and resellers are just a few of the perks that come along with our services. Lime’s White Label Mobile Marketing solution was developed for marketing service providers, media/ad agencies, and telecom providers serving their own clients and customers. It’s a great way to bring effective mobile marketing services to your customers. 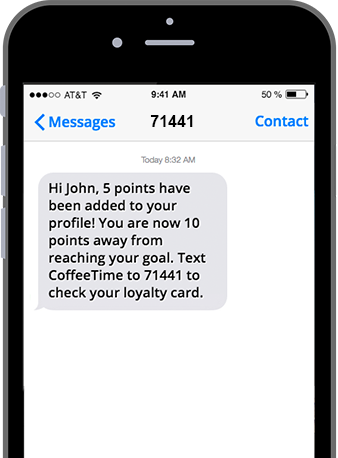 With this platform in place, our SMS Platform users can service any number of advertiser accounts simultaneously – all from our easy-to-use administrative dashboard. Lime provides an all-inclusive, branded platform that delivers everything you need to create a user interface that will seamlessly appear as if the technology behind it, is all yours. Our pricing system makes it simple for you to maintain full control over your pricing plan. You set your own pricing for credits, keywords and subscription. We provide a comprehensive billing system that is completely customizable. 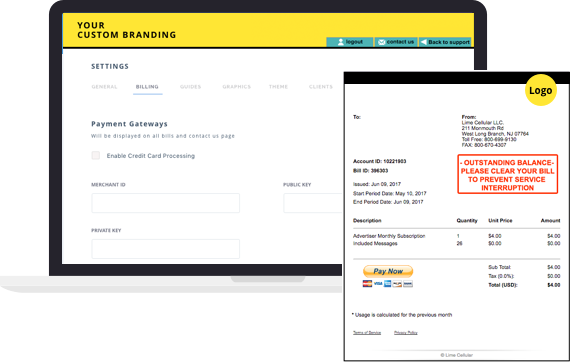 Automatically generate monthly bills and calculate subscriptions and keep track of keywords and messages used. Maintain full control on your sales agents’ accounts. Assign agents to groups, have a tracking code for web sales and even a promotion code for each one of them. Allows you to send text messages using a toll-free number.